FIXYOURTHINKING.COM / Need a brain? Borrow mine! : A CopyCat Suing Apple For Being The Best? 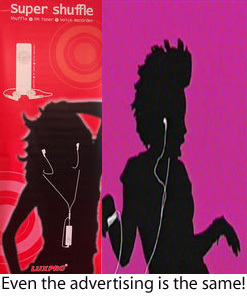 A story on the Financial Times Web site reports that Taiwanese electronics firm Luxpro, which won a lawsuit filed against it by Apple over an iPod shuffle "imitation," has now countersued the company. "We plan to sue Apple in a Taiwanese court before the end of the month and demand $100m in compensation for the revenues we have lost due to their abuse of their global power," Wu Fu-chin, Luxpro chairman, told the Financial Times. Apple could not be reached for comment. This is nothing short of absurd. 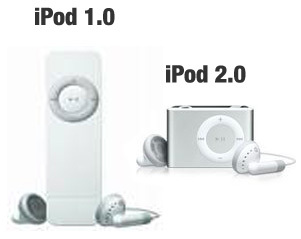 If you remember, LuxPro is the company who came out with a widely discussed iPod Shuffle (1st gen) imitation initially called The Super Shuffle (later changed names to Super Tangent). I wasn't aware that Apple had lost any litigation regarding this "design/trade dress" lawsuit. The Financial Times fails to link to any website or court decision regarding this issue. Could LuxPro have possibly tricked the court by presenting the latest Shuffle (2.0) design as evidence of "not copying"? It just seems weird that a judge couldn't see this was a blatant copy of an existing product meant solely to capitalize on the sales and advertising of another company.